Our email template design services are a natural extension of our web design and development skills. Not only are the technologies used very similar but there is normally a requirement for your emails to follow the theme of your website design. Designing and building email templates is a very particular skill, however - not only do we take account of general good design practice but we are also very aware of the particular ways in which HTML emails should be built to ensure that they can be read on a wide range of platforms - not only well-known email programs (such as Outlook or Thunderbird) running on any environment (Windows, Mac, Linux, etc.) but also the popular web-based applications, such as Hotmail and Gmail. All of these display email differently. Furthermore, of course, we need to take into account the different ways in which an email can appear across a range of devices - from SmartPhones through tablets and PCs. We also take into account the fact that most modern email programs do not download images unless asked to by the operator. This means that we need to be conscious of how the email will look without it's rich content. We have prepared a case study showing how one of our customers, tools-warehouse.co.uk, have used this facility to create an easy-to-use monthly email template containing special offers for their customers. Click here to view the Tools-Warehouse Case Study. One area where we can offer a unique benefit is to customers with the axis diplomat back office software, especially when linked to an axis vMerchant website. 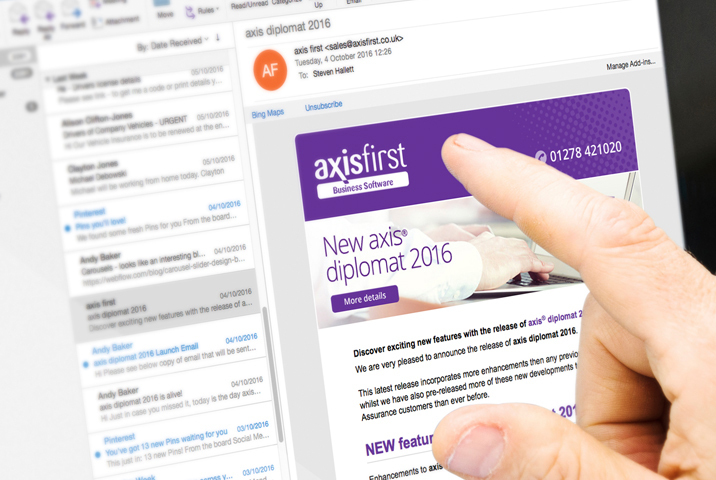 axis diplomat has the ability to send emails to all or a selected range of customers (this is especially powerful when used with Gap Analysis) and can download it's email template from your website. axis vMerchant has the ability to pre-populate an email template with information from your stock ledger (such as showing those items currently flagged as Special Offer, their pricing, descriptions and images) so, together, this gives you the ability to send out product-related emails without ever needing modify the email template! 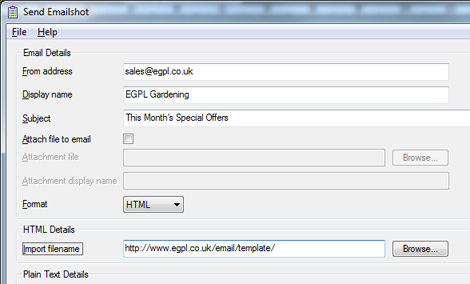 Your email template is configured to show all stock items in your axis diplomat system flagged as "Featured Item". Using axis diplomat's Stock Ledger, you make sure that the Featured Items correctly identify the products you want to feature in your email. Using axis vMerchant's CMS, you update the Introductory paragraph of text used in the email template. In the initial dialogue (see above), you have the ability to either send to everyone or to a select range of customers (by customer group, for example). 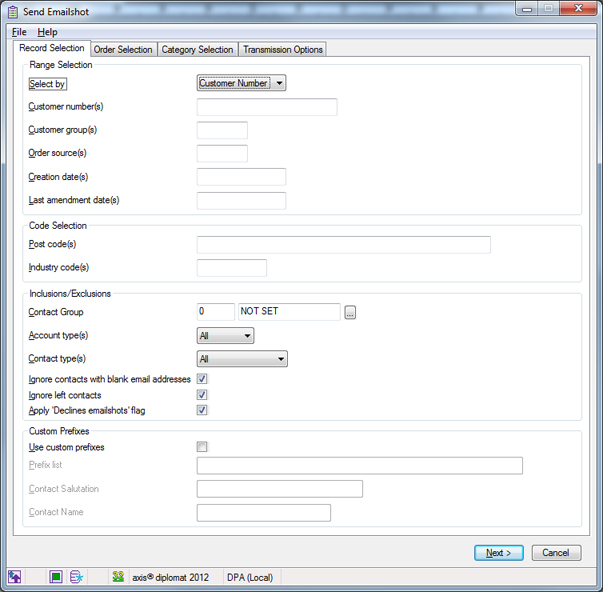 In the final dialogue (shown above), you specify basic details about the emails to be sent (such as the from address and the subject). You can then specify the web address of the email template that we have built for you as the "Import filename" address, rather than pointing to a HTML template on your local drive. You can then sit back and watch your emails being sent to all of your customers, without any need to go anywhere need HTML or any special web editing tools!